I’d only partially been involved with the creation of the DVD masters of Captain Scarlet – having cleaned-up a few episodes – so the chance to create new HD masters of the series from the original negatives a year ago was a joy, and indeed an eye opener with regard to the superb model work and detail that was reproduced. 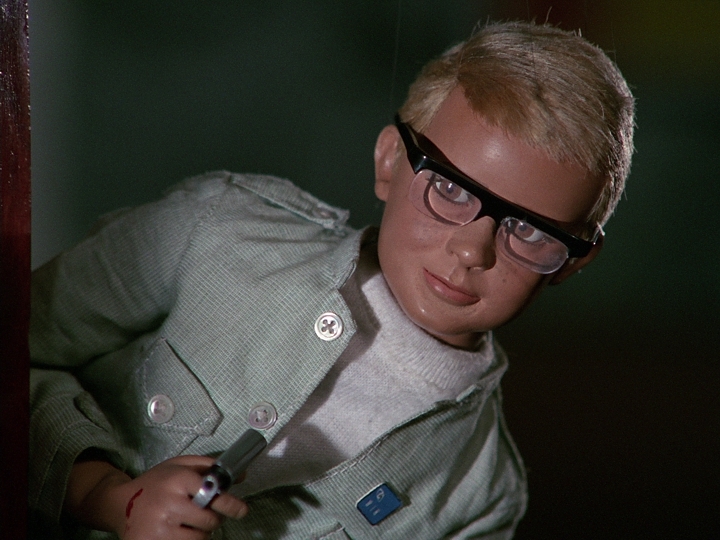 Even more impressive though, was the follow-up to that series, Joe 90. 17 years ago when I graded this 2nd ‘realistic’ puppet series from inter-positive film elements, I was amazed then with the production standard. Working from the master negatives this time around in the same way as Captain Scarlet I was blown away with the level of detail in the sets, the realistic puppet movements and the lighting. It’s as if all the lessons learnt producing the prior series had allowed the production team to hone their skills and techniques to the absolute pinnacle. Coupled with that, the somewhat more familiar domestic settings such as the cottage (albeit with a huge underground laboratory) and dare I say less militaristic characters with more depth, the resulting level of realism throughout feels unsurpassed. Surprising as well is the adult nature of it all, despite the series being named after and following the adventures of a 9 year old boy. There’s the same level of destruction and explosive action as before, with firing squads, super villains, military dictatorships and so on. However, there seems more peril with Joe… there’s sometimes blood literally on his hands and if he ever finds himself without his special glasses during a mission he is left purely with his own wits as a small boy. Also, in the episode “A King for a Day” it appears there was a late decision to remove a filmed scene where Regent Ben Shazar is enjoying the delights of an exotic dancer! All that now remains is a glimpse on the extreme right of the film frame of the dancing female character in green as the shot zooms in. As usual with the remastering of a film series such as this, special attention is given to creating a digital version for the main title sequence as this will be used for each episode. With the SD transfers, the existing printed composite of background shots and captions was simply graded from one of the episodes and given a rudimentary clean. However, upon examination of the sequence in HD it was clear this approach was simply not up to the job. The titles composite contains a large amount of fine printed black dirt throughout, which was far less visible in SD but very distracting in HD. Normally a fair amount of image dirt can be removed with automated digital processes that examine each frame and calculate (dependant upon settings) what is dirt and then digitally removes it. Unfortunately, the high motion nature of the Joe 90 title sequence with the rat trap cage rotating at speed throughout most shots rendered this type of dirt processing inoperable.  A text-less inter-positive element was then checked and not only had better clarity, but was also free from the constant fine black flecks – although there were many other markings. It seems the optical printing stage of adding the captions had caused the black dirt problem in the final version, as well as softening the overall image. Sadly the first shot in the text-less element was unusable due to severe wear and tear (noticed during the SD remastering) and so an answer for that still had to be found. In the early episodes the rat-trap sequence is used fairly extensively and the majority of the first shot was available this way, but even the longest example stopped short of full length in the main titles. In the end, the master sequence ended up being constructed from three film elements – in episode material, the original titles composite dupe and the text-less inter-pos. Even though the best available film elements had been combined there was still a lot of dirt to remove, including the plethora of black flecks around the section with the series title caption. Normally a lot of manual repairs use an interpolation tool that looks at the motion between preceding and following frames to create an invisible fix. 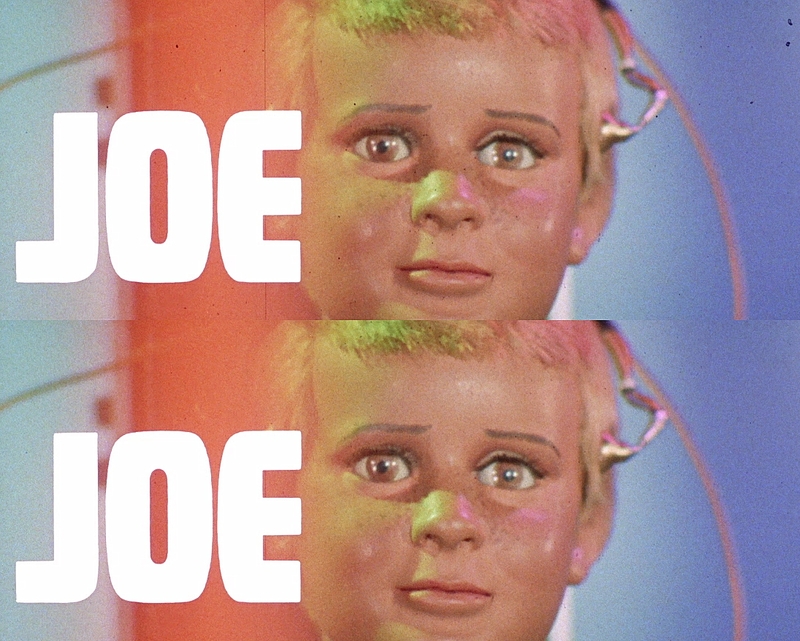 With all that’s going on in the Joe 90 title sequence this was also generally unusable, so a different tool was employed on another platform to the usual grading and restoration software. This allowed small repairs to be made from information only in the current frame. This was a fully manually process which took myself and colleague Amanda many hours to complete successfully due to the sheer amount of fine dirt on each frame. The result was a new digital HD master of the title sequence, free from blemishes and with improved clarity and colour over the original printed composite. The only other thing was sourcing the alternate 2nd shot of the bearing, which is occasionally used in some episodes showing the lower part of the rotating mechanism in a different position. Why there was this variation is anyone’s guess. As with all the Supermarionation series, there is a fair amount of re-used footage or repeated stock shots that manifest themselves as lower quality dupe images. These can suffer from flicker, instability, severe grain, flare, printed dirt… just about everything that can be wrong with a film image and of course, it’s all the more distracting in HD sitting alongside the 1st generation scenes. The equivalent of the cloudbase shots in Scarlet is the cottage in Joe, likewise the launch of the interceptors is the BIGRAT sequence. As before, an attempt is made to build up a library of already repaired shots so that these can be used again in subsequent episodes. Also as before, it seemed more often than not that the version of a shot in following episodes became longer or was a different section to the library shot previously created, meaning the process had to begin again. In a couple of cases, I recognised re-used shots lifted from Captain Scarlet and so I was able to go back to the digital masters of that series and drop in higher quality footage. The grading this time around should be more realistic and with greater sympathy for the narrative, as working from the negative, it’s easier to see the intentions of the production team. Any subsequent film generation has gone through a printing process that can alter the density and balance of a scene, and so can somewhat be removed from the original. When I compared with the SD masters I found some shots remarkably similar whereas others – most notably night scenes – were a lot moodier and yet with the added clarity of HD and the negative source no less detailed. The approach has been to treat it as a standard live action drama, except that there is more variability to deal with due to the complexity of the production between different stages and model scales. Even though producing new HD masters of these puppet series is an awful lot of work – being generally far more fiddly than a standard live action ITC show – the results are more than worth the effort. Finally, the skill and hard work of the original team of model-makers and puppeteers is vividly clear on screen in a quality not previously viewable. What better way to celebrate the show’s 50th anniversary? A fascinating article about the restoration of Joe 90 from the camera original negatives no less, filmed by professional cinematographers. I had no idea that Jonathan and his team went to such lengths to secure the very best HD quality. This is a perfect example showing that Britain leads the world, in my humble opinion, in this field – I cannot recall the USA taking so much care over any American television series! What foresight Lew Grade and Gerry Anderson had in the 60s in future proofing these classic programmes by using 35mm – TV series produced in high definition 30+ years before the UK had a high definition system! (I imagine 35mm may even be capable of a 4K restoration one day?). I used to watch all the Gerry Anderson series on television as a boy in the 70s (usually on London Weekend if memory serves correctly), and Joe 90 and Captain Scarlet were among my favourite puppet series as they had that extra depth of realism about them. Such was the ITV network in those days where advertising revenue was spent where it belonged – in production values in an age when, I am proud to say, Britain boasted the finest quality television output in the world. I hope Network will continue to release further ITC series in beautifully restored blu ray. Amongst my wish list are Danger Man and The Saint. I also look forward to buying MIAS when the whole series is completed in BD. Thank you Jonathan for all the painstaking work you and your team lovingly put into these magical TV series allowing us to enjoy them in a new lease of life. (Incidentally I watch these series on a 9′ projection screen and even then the pictures are crisp and sharp with beautiful colour balance).